Defense Ministry decides to resume construction on southern border halted after Monday's terror attack. The Defense Ministry has decided to resume construction work on the border fence in south Israel on Tuesday which had been suspended in the wake of Monday's terrorist attack which killed one person. 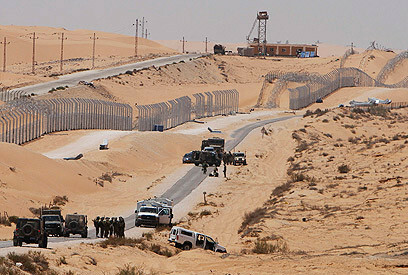 It is estimated that the construction of the fence in the "dune sector" where the attack took place will be completed within three weeks. The Defense Ministry said that construction has been fully resumed following a situation assessment which was held on Monday. The project manager, Brigadier-General Eran Ofir, informed the Ministry that workers and heavy machinery operators have been deployed in hundreds of sites where the fence is being erected. Contractors reportedly raised concerns in the wake of Monday's attack but remain determined to complete the task as soon as possible. Security for the project is provided both by civilian companies and IDF forces in the field. Army posts have been added along the border in the past few months. The posts have also been fortified for fear of long-range anti-tank missiles stored in Sinai and advanced models of RPG missiles owned by terrorist groups in Gaza. These have been utilized in Monday's border attack as well as in the terrorist attack in Eilat last August. According to the Defense Ministry, more than 1,000 workers, 100 contractors and dozens of team leaders are operating in 600 points along the border. The Ministry stressed they are in constant contact with the contractors who are being briefed on the situation assessments. Gaza Division's southern brigade commander Colonel Tal Hermoni stressed on Tuesday that the forces are in close contact with their Egyptian counterparts, who he said had tried to locate the terrorists behind the border attack inside Sinai. On Monday, the US condemned the border attack. State Department spokeswoman Victoria Nuland said that the US condemns the attack against civilians in the strongest terms and noted that Washington "remains concerned about the security situation in the Sinai Peninsula and call for restraint on all sides." "More broadly, we encourage the Egyptian government to find a lasting resolution to the issue of Sinai security," she told reporters at a regular news briefing. While a senior Israeli official blamed the Islamic Jihad for the attack, other sources admitted that defense officials are still unclear as to who was behind the attack. Beit El's rabbi says settler reps, government close to finalizing deal on voluntary evacuation of five homes built on Palestinian land; according to deal, 10 apartment buildings will be constructed in settlement. It appears that a confrontation between Jewish settlers and security forces will be avoided: Beit El Chief Rabbi Zalman Melamed said Monday evening that a deal on the voluntary evacuation of five homes in the settlement's Ulpana neighborhood was imminent. Melamed, who has been negotiating with the government on behalf of the neighborhood's residents, said all activity surrounding the settlement will be frozen for the next 24 hours, adding that the agreement, if finalized, would include "significant achievements" for the settlers. The High Court has instructed the State to evacuate five homes in Ulpana by July 1 because they were built on private Palestinian land. According to the agreement, 10 apartment buildings consisting of 30 units each will be built in Beit El. The buildings will be constructed on the grounds of a Border Guard base situated at the entrance to the settlement. The base will be evacuated. A leader of the teenagers who planned to resist the evacuation said in response to the agreement, "We are very angry. If it's true – we were sold out. "They are doing to us exactly what they did to Gush Katif (in Gaza) and Migron. We haven’t learned anything," he told Ynet Monday night. On Sunday, dozens of youngsters equipped with hundreds of sacks of cement, iron rods, wooden boards, and mechanical equipment arrived at Ulpana. They began building barricades around the neighborhood and on top of the homes slated to be evacuated. The teens also set up barriers at the entrance to the neighborhood, where they remain in contact via MIRS phones. Throughout the day, some of them – wearing masks – threw rocks at soldiers who happened to be in the area and at anyone else they suspected of being involved with the evacuation. However, Rabbi Melamed said that even if a deal is not struck, the evacuation will be non-violent. 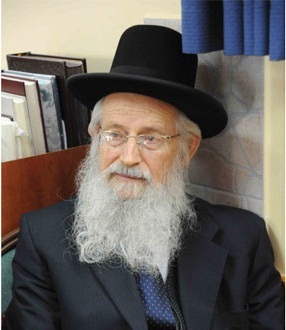 Violent resistance would taint the settlers' image in the media, the rabbi told his students. The rabbi said he decided to reach an agreement with the government after realizing the evacuation could not be avoided. Details of the agreement were discussed Monday during a meeting between settler representatives and senior political and military figures, including Environmental Protection Minister Gilad Erdan, Cabinet Secretary Zvi Hauser and Major General Eitan Dangot, the coordinator of government activities in the territories. Government officials confirmed that significant headway was made towards a non-violent evacuation of homes in Ulpana. In a move meant to placate the Right following the failed vote on the settlement regulation bill, Prime Minister Benjamin Netanyahu recently approved the construction of 851 housing units in the West Bank – 300 for Beit El and 551 for four other settlements. The settlement regulation bill, which attempted evade the High Court ruling by retroactively legalizing Jewish outposts, was voted down by the Knesset. The Israeli government ratified, on Sunday during its weekly session, the formation of a ministerial committee concerned with settlements' affairs in the occupied West Bank, with expectation that this step will pave the way to implement large settlement projects in the West Bank. Khalil Tofakji, head of the Mapping Department of the Arab Studies Society, explained that the formation of this committee aims to justify the settlements in the West Bank legally and avoiding confrontation with the Israeli courts especially the Supreme Court. 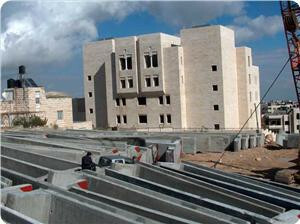 Secondly, it aims to implement the outstanding settlement plans in the West Bank. Tofakji said, in a press release, that this committee is linked to the Israeli Prime Minister and not, as previously, to Defense Minister who was the decision maker, and who has the final word. He added that it's a deliberate process to make the committee of ministers the responsible for all the settlements' affairs in the West Bank. The committee is composed of settlers' leaders and the Yesha Council of the settlement blocs in the West Bank, in order to plan the future settlement project of the State that is intended to be established in the West Bank. Tufakji warned against the establishment of this committee that aims to implement a large number of settlement projects in the Jordan Valley in order to close the western side to prevent any geographical contiguity with Jordan, as well as the settlement project in the so-called "greater Jerusalem" and to legalize West Bank outposts. He confirmed that there is an intention to implement all settlement projects, and completing those that were started noting that this has actually begun by the announcement of a tender for the building of 27 new housing units in the Betar Illit settlement which is built on Nahalin and Husan territories inhabited by 18 thousand extremist settlers. He explained that the "structural plan for the Beitar Illit settlement is aimed to establish 8000 new housing units." Ramat Negev Regional Council says work done without proper permit. Defense Ministry says acting lawfully and under PM's guidelines. The Ramat Negev Regional Council issued a razing order and an order to cease construction against work on a tent city meant to house thousands of infiltrators, citing lack of permit as the reason. A letter sent by Ramat Negev Council head Shmulik Rifman, who also serves as the local planning and construction committee chairman, said that all construction was done without a permit and must be ceased and destroyed. The committee said that construction had ceased as a result. Rifman accused the Defense Ministry of improper conduct. "Construction commenced without a permit and that is why we issued a razing order," he said. "If the ministry fails to comply we shall take this to court." Rifman has voiced opposition to the expansion of the Saharonim prison and the construction of another detention center for infiltrators several times in the past. Two years ago, he sent a letter to Prime Minister Benjamin Netanyahu claiming that "5,000 work migrants will cause a drop in the quality of life and a rise in crime rates." The Defense Ministry said in response, "The ministry is working under the prime minister's guidelines and according to the law. The ministry is the most experienced body in setting up national projects in a short period of time. The plan for the construction of infiltrator facilities will be brought for the approval of the national planning and construction committee next week." 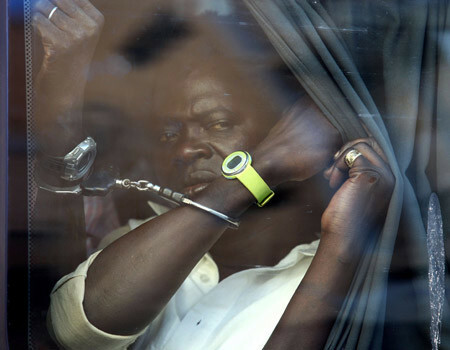 Last week, the Defense Ministry announced that 20,000-25,000 holding cells for infiltrators in five separate facilities will be added by the end of the year, after a court ruling okayed the deportation of 1,500 South Sudanese citizens. Premier proposes committee on settlement issues in bid to appease right-wing, settler leaders after cabinet struck down bill to regulate West Bank outposts built on private Palestinian land. A move by Prime Minister Benjamin Netanyahu to appease settlers, by seemingly mitigating Defense Minister Ehud Barak's pull on settlement matters, does not in fact reduce Barak's current influence, Haaretz learned on Thursday. Earlier this month, Netanyahu listed a number of measures he intended to take to bolster West Bank settlement activity, in an apparent attempt to ameliorate backlash over the cabinet's refusal to pass a bill to regulate illegal West Bank outposts. Specifically, the PM promised that the Beit El settlement, of which Ulpana Hill is a neighborhood, will be expanded by 300 new homes. In another measure, Netanyahu acceded to a long-standing settler demand by promising to divest Barak of the sole authority to approve or veto new construction in the settlements and transfer this authority to a ministerial committee. 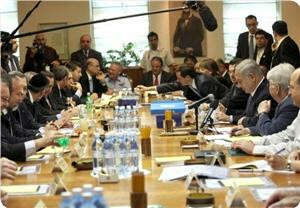 Netanyahu is due to submit the committee's formation to the cabinet's approval on Sunday. However, an examination of the details of that submission reveals that the defense minister's authority on West Bank issues remains untouched. Stating the panel's official mandate, the proposal said that the committee would discuss unregulated settlement construction on state-owned and private lands in the West Bank, and form government policy on the matter; discuss government policy on principled issues surfacing in court appeals concerning the West Bank; discuss ongoing settlement matters, and anything the premier wishes to raise related to settlement issues. The mandate's vague and general wording, especially that of the last clause, raises questions as to its de-facto jurisdiction. These doubts seem to be supported by the clarification attached to the proposal written by legal adviser to the Prime Minister's Office, Shulamit Barnea-Farago. "The decision does not diminish the prime minister and defense minister's authority, as stated in government decisions, according to which the defense minister has the authority to approve construction and planning in the West Bank," Barnea-Farago wrote. 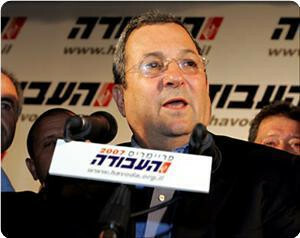 Barak did not voice his official position concerning the formation of the ministerial committee on settlements, with the proposal drafted ahead of Sunday's cabinet meetings stating that the defense minister has not yet conveyed his stance. In addition, the proposal indicates that the panel provides an automatic majority to right-wing ministers. Other than Netanyahu, Barak and Vice Prime Minister Shaul Mofaz, the panel will also include Foreign Minister Avigdor Lieberman, Science and Technology Minister Daniel Hershkowitz, Interior Minister Eli Yishai, Vice Prime Minister Moshe Ya'alon, Minister Benny Begin, Public Diplomacy and Diaspora Affairs Yuli Edelstein, Education Minister Gideon Sa'ar, and Evironmetal Protection Minster Gilad Erdan. Chief Palestinian negotiator Saeb Erekat Thursday said the Quartet for Middle East peace has failed to stop Israel’s illegal activities in the occupied Palestinian Territory. He called on the Quartet, which is composed of the United Nations, the European Union, the United States and Russia, to restore credibility and relevance to its role in protecting the prospects of peace in the Middle East. Deputy head of Hamas's political bureau Moussa Abu Marzouk criticized the political settlement process as a charade and waste of time and said there is no solution on the horizon. In a press statement to the London-based Al-Hayat newspaper on Thursday, Abu Marzouk also scoffed at the Palestinian authority's demand for new weapons for its security forces in exchange for resuming the peace talks with Israel, and described it as irrational and absurd. He affirmed that Israel does not want the Palestinian authority's assistance and can impose the situation it likes anytime in the West Bank. As for the national talks, the Hamas official affirmed that his Movement handed Fatah faction a tape recording about the attempted bombing of the central election commission headquarters in Gaza. He noted that a meeting was supposed to take place between the two sides to reach an agreement on the names that will occupy the portfolios in the national unity government, but some people delayed it until the election commission finishes its arrangement of the voter rolls. Israeli premier Benjamin Netanyahu has issued orders for the construction of a wall along the borders with Jordan, the Hebrew radio said. It quoted Eran Ofir, a member of the committee in charge of planning border fences, as saying that Netanyahu instructed the committee to study the proposal. 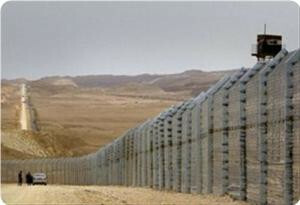 Ofir, who is also supervising the wall being built along the borders with Egypt, said that the wall with Egypt would be completed by 2013. He explained that 181 kilometers of that wall had finished out of the total 227 kilometers. He said that around one thousand workers were working on the building of that wall. Catherine Ashton, the High Representative of the European Union for Foreign Affairs and Security Policy, said on Tuesday that the Israeli settlements in the occupied Palestinian territory threaten the viability of a two-state solution. Ashton, in her address to the European Parliament, said the Israeli proposals for new settlements around East Jerusalem, the lack of Palestinian involvement in area C, the growth of settlements in the West Bank, settler violence and the financial situation of the Palestinian Authority all threaten the viability of a two state solution. “Settlement expansion must be condemned as they are illegal under international law and put current peace efforts at risk. I want to reiterate my call on the Israeli Government to exercise the highest sense of responsibility by reversing these decisions, in full respect of international law,” she added. Ashton stated that the EU will not recognize any changes to the pre-1967 lines, including with regard to Jerusalem, unless they are agreed by both parties and insisted on the need to respect international and humanitarian law is absolutely consistent, stressing that settlements remain the key and most serious concern. She said the Israeli plans for major settlement expansion around Ease Jerusalem’s southern flank further undermines the prospect of Jerusalem as future capital of two states. The High Representative indicated that the EU Foreign Ministers underlined the need to work with the Commission to ensure EU legislation is implemented effectively and with as much transparency as possible in regard to settlement products. She thanked the European Parliament for its principled and constructive position with regard to the EU’s Budget to support precarious state of the PA finances and urged countries in the region and others to share the burden and increase their support. The Israeli occupation army is planning to build a military watchtower near Kharsa village to the south of Al-Khalil, local sources said. They said that the Israeli occupation forces (IOF) surveyed and marked the area on Monday in preparation for building the watchtower. Eyewitnesses from Kharsa village told the PIC that three IOF patrols arrived in the area and started to lay down the marks, adding that the soldiers would use the watchtower to monitor movement of Palestinians in a bid to protect the Jewish settlers trekking the area. 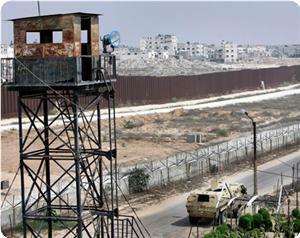 They noted that the watchtower would overlook and monitor a number of villages south of Al-Khalil. The Spanish government condemned in a statement published Tuesday an Israeli government decision to build hundreds of housing units in illegal West Bank settlements. The statement by the Spanish foreign ministry said that all of the West Bank settlements are illegal under international law, contradict Israeli commitments and obligations toward the international community and contribute to complicating chance of reaching a peace agreement. It considered settlement activity as a new obstacle to the re-lunching of negotiations between the Palestinians and Israel that will allow the reaching of a just, comprehensive and lasting peace in the Middle East with two states coexisting side by side in peace and security. The Israeli District Committee for Planning and Building in Jerusalem approved, on Monday, a plan to establish a new settler building over three dunums in Silwan close to Bayt Al-Ayn mosque financed by the Elad settlement organization. The Al-Aqsa Foundation for Endowment and Heritage, in occupied East Jerusalem, said in a statement that Elad plan is to use the building as a visitors' center or a museum on "the history of the Siloam Spring". This plan came as a part of a previous scheme that was approved three months ago to establish a huge settler building in Wadi Al-Hilwa neighborhood in the north entrance of Silwan town a few meters away from the Maghrebi Gate expanded over nine dunums under the name of "Biblical structure" with a governmental decision. The foundation stated that this governmental decision was issued few days ago under the number 4654. 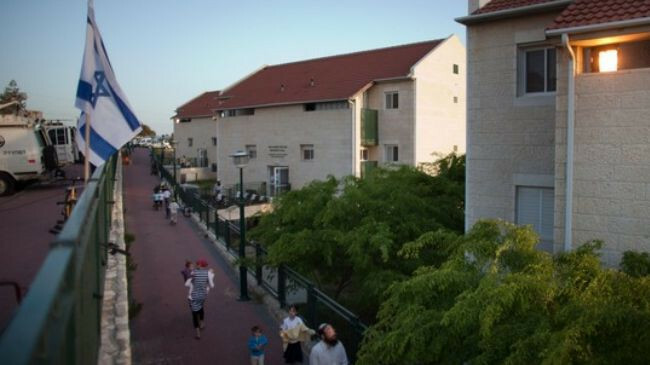 According to a report by Haaretz newspaper, the Jerusalem municipality and the Israeli ministry of tourism transferred 2 million NIS for the construction of a Jewish museum in an Elad-controlled structure in the heart of Silwan village. The structure, which belongs to Moussa Abbasi, was confiscated by the Israeli state using the Absentee Property Law. Shortly after, the structure was leased long-term to Elad Association. This move is just one in a series of provocations and part of a policy, endorsed by the Israeli authorities, to expand the Jewish presence in East Jerusalem in general and in Silwan in particular, at the expense of Palestinian residents. The Foundation warned against such projects that aim to Judaize Jerusalem and Al-Aqsa mosque, stressing that this project came as part of a plan to surround Al-Aqsa mosque from the south and the west by seven huge buildings which would constitute the alleged temple's utilities and centers for the dissemination of the alleged biblical and Talmudic versions on occupied Jerusalem. The weekly newspaper Yerushalayim said the Jewish billionaire Irving Mashkevitch intends to build 350 settlement units in occupied Jerusalem near the Knesset building in Abu Dis area. According to the newspaper, the aides of Mashkevitch will submit a plan for these units in the coming weeks to the Israeli committee for planning and building. The newspaper added that this Israeli committee declared in advance its approval of this plan as it would help it resume the frozen construction work in the Jewish settlement outpost Kedmat Tzion in Abu Dis. France condemned an Israeli decision to build hundreds of new housing units in illegal West Bank settlements, describing the decision as provocative, French Foreign Ministry spokesman Bernard Valero said Thursday. “We condemn the announcements made yesterday by the Israeli prime minister and minister for housing relating to the construction of several hundred new homes in the settlements of the West Bank, some of them located far from the 1967 lines, at a time when it's essential, above all, to avoid provocations and to renew the dialogue between the parties,” he said. “We urge Prime Minister Benjamin Netanyahu to refrain from implementing these announcements. We reaffirm that settlement activity is illegal under international law, undermines, on the ground, the foundations of the two-State solution and constitutes an obstacle to peace,” he said. 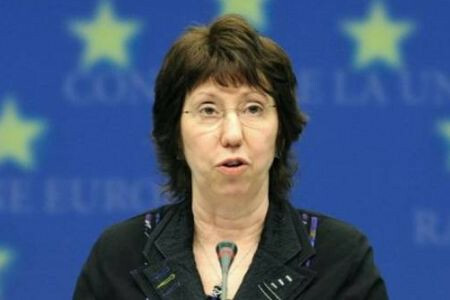 European Union foreign policy chief Catherine Ashton Friday said Israel’s settlement activity is detrimental to peace efforts. Ashton was reacting to Israeli government plans to build hundreds of housing units in illegal West Bank settlements as well as relocate settlers from outposts to regular settlement, also within the occupied West Bank. “I call on the Israeli government to exercise the highest sense of responsibility by reversing these decisions to demonstrate its commitment toward the peace process, in full respect of international law,” concluded Ashton. Germany expressed concern about Israeli plans to build 851 housing units in West Bank settlements saying this step is counter to efforts to re-launch stalled peace talks, German Foreign Ministry spokesman Andreas Peschke said Thursday. Israeli Prime Minister Benjamin Netanyahu announced that he has approved the construction of these housing units in a step to appease fanatic Jewish settlers who are supposed to be evicted from five houses built on private Palestinian land in the Ramallah-area illegal settlement of Beit El, which was also built on private Palestinian land. “The German government is very concerned about the Israeli announcement to build 851 new housing units in Israeli settlements in the West Bank,” he said. “It shares the opinion that such steps run counter all efforts to re-launch peace talks between Israelis and Palestinians,” he added. German Foreign Minister Guido Westerwelle called on the Israeli government and the Palestinian Authority “to use their room of maneuver for courageous decisions in the peace process, so as to allow new talks,” he added. “The feasibility of a two-state solution must not be called into question by unilateral steps. We are calling on both sides to resume the dialogue and to refrain from unilateral and provocative steps,” concluded Peschke. The British Foreign Office considered that the "continued systematic settlement activity, and repeated breaches by the Israeli government of international law, is provocative, undermines the prospects of peace." "I condemn the announcement by Israel to authorize the building of 851 new settlement units across the West Bank [...] The decision to move settlers from an illegal outpost by creating housing units in settlements elsewhere across the Green Line sets a dangerous precedent. 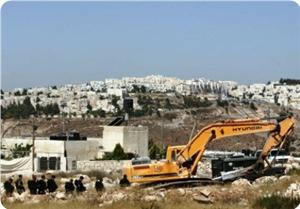 Such outposts are illegal under both Israeli and international law and should be removed entirely." “Continued systematic settlement activity, and repeated breaches by the Israeli Government of international law, is provocative, undermines the prospects of peace between Israel and the Palestinians, and makes the two-State solution ever harder to realize. It makes it increasingly difficult for Israel’s international friends to defend the Israeli Government's actions"
“I urge the Israeli Government to change its approach, to meet its international obligations fully and for both sides to engage constructively in the search for peace.” Hague said.